Poetry Flash presents Francisco X. Alarcon & Melinda Palacio, Thursday, January 24th. Francisco X. Alarcón's new book of poems is Ce Uno One: Poemas para el Nuevo Sol/Poems for the New Sun. His book poetically announces the New Sun---which the Mayans believe arrives in 2012---and he identifies as the era of the "Flower Sun" when the world's great concerns will be "the colors/ and the scents/ of flowers/ sprouting/ from nowhere/ everywhere. . ." He is the author of twelve books of poems, including Sonnets to Madness and Other Misfortunes and De Amor Oscuro/ Of Dark Love, and a number of bilingual books for children. His many honors include the 1993 American Book Award, the 1993 PEN-Oakland Josephine Miles Award, the 1984 Chicano Literary Prize, and the Fred Cody Lifetime Achievement Award from the Northern California Book Reviewers. Francisco X. Alarcon, Animal Poems of the Iguazu/Animalario del Iguazu (English and Spanish Edition). Visit from bi-lingual poet and educator Francisco X. Alarcon held at the Learning Center. 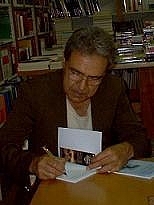 Francisco X. Alarcón is currently considered a "single author." If one or more works are by a distinct, homonymous authors, go ahead and split the author. Francisco X. Alarcón is composed of 3 names. You can examine and separate out names.